That is how long it’s been since I have updated this blog. I had a round up planned for the new year, a selection of interesting things I found (mostly via YA Highway) and read throughout the year, a selection of important things that happened in 2012 in the publishing industry, a selection of books which I thought were brilliant. But it’s been a month. And that hasn’t happened. January was supposed to be a time of productivity, work, finding placements. (The latter I have at least attempted to no reply… so far.) January is not going as planned. I have to apologise for the lack of updates and for this entry as well, and for the sparse entries that will follow. I didn’t want to make this blog too personal, only including the important things like Graduation (and the pretty cupcakes that occurred around that time because everyone needs cupcakes sometimes), so I will keep this short: on December 29th, 2012, I lost someone and I’m still trying to figure out how I feel. I don’t know how long it will take, it’s always different, but I do know that I will try to update this more often with interesting bookish things. I just need to get back into the swing of things again. I can be good at this blogging thing. I really can. Sometimes. 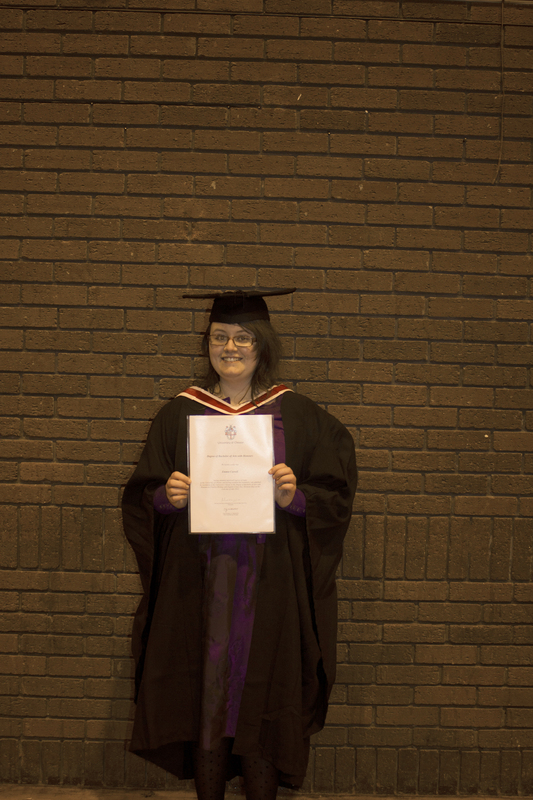 So last Friday (Nov. 2nd) I graduated from my BA at the University of Chester and here I am in all my gowny glory after having walked through the city in the rain. 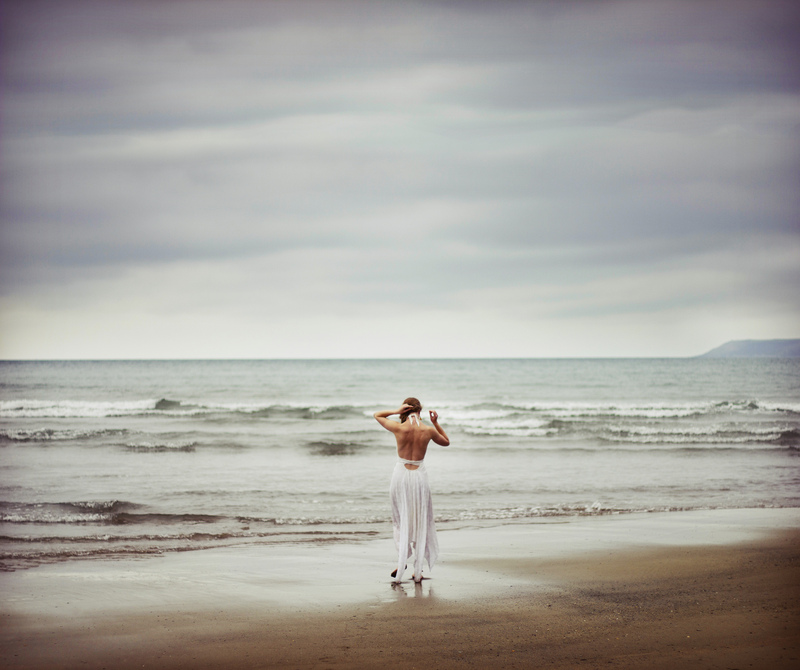 It was just our luck that it would begin pelting at us as soon as our ceremony was over. But despite the rain it was a lovely day and I got to see all of the beautiful people who I’ve been missing since leaving Chester. It was odd being a postgraduate student before I had actually graduated from my previous university and now I have I feel a lot more like a real person on a real degree in preparation for the real publishing world. (Yes, before I graduated everything was a little bit surreal.) It’s scary but I’m loving it. Three years ago, graduation seemed very far away. Four years ago, I don’t think I even knew it was a possibility. My choice to go to university was made not through weeks and months of careful research and thinking but over about a week of looking at pictures of universities and what courses they had as part of a college class. I found Chester and I fell in love with it. When I discovered it had a Creative Writing course in my head I was there already. I applied to four other universities and was offered conditional places at all of them but I never really thought about going to any of them; I applied because I was told I should. For me, it was Chester or nothing. Months later, I didn’t do as well as I thought I had in my A Levels and I thought university, and Chester, had slipped away from me. It took a horrible week of endless crying for them to tell me that even though I didn’t get enough points to meet the conditions of their offer, they were letting me in anyway. I have never felt such relief in my life. Now, I’m half way through the first semester of my Masters. It’s scary how fast all of this has happened. Anyway, back to graduation. After getting the gown and the awkward professionally taken photo which should arrive at my house in four to six weeks (I am not looking forward to it), myself, my family, my boyfriend and his family wandered into the city centre to await our ceremony. There were photos, shivering, squinting and the loss of our fathers who went on the hunt for coffee before we went into the Cathedral. I didn’t find out until a few days later where they actually ended up, luckily they got back just in time to be let in. The ceremony was, well, a graduation ceremony with speeches and the procession of lecturers and such and the steady stream of graduates collecting their certificates. It made me smile that all of my friends got cheers as they went to accept their degrees and by smile, I mean grin like a fool. I was so worried about my shoes falling off that I think my own acceptance and walk around the Cathedral might have been painted with a small frown but I did make every attempt to smile at that too! After the ceremony, there was no real time for photos as the rain started and we had to rush to get our gowns back to the hire company before they got sopping wet. The rest of the weekend was coloured with food and a lovely warm hotel room, which brings me the to the cupcakes part of the title. There’s a beautiful little tea room in Chester called Mad Hatters, who sell the most amazing cupcakes and bring out themed cupcakes for special occasions and public holidays. As it was near Bonfire Night, they did not disappoint. 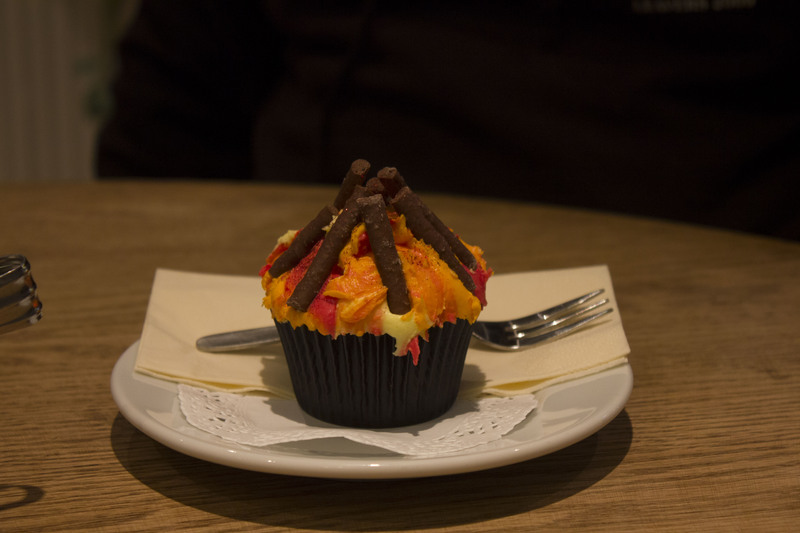 Above is the Bonfire cupcake, purchased by a friend. I love the design of this cupcake, it was aptly chocolate orange flavour. 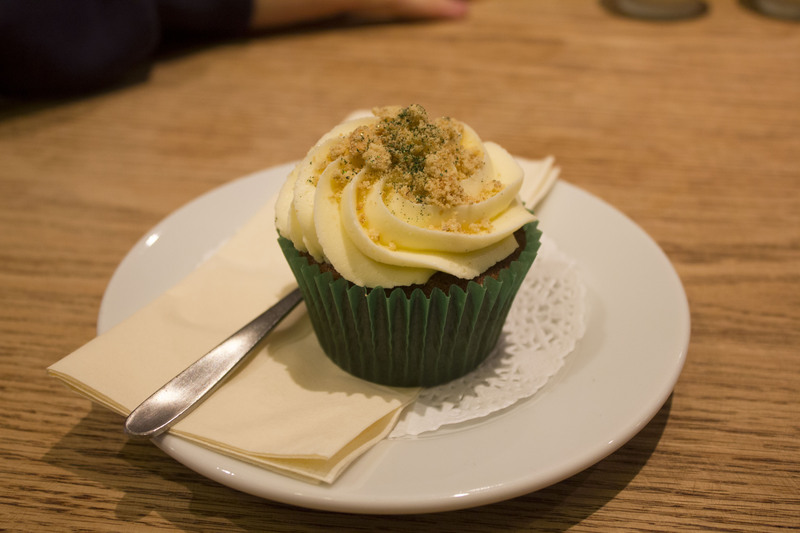 Below is my apple and cinnamon cupcake and it was delicious. I have a weakness for apple and cinnamon flavoured things. All in all, it was a lovely weekend. My next blog entry will be back on a publishing vein, looking at beautiful old photos and their usage in books and some which I picked up in Chester after graduation. So tune in within the next few days for that.